Cam Talbot made 23 saves, but the Rangers could not come away with a win, dropping their second straight game, but this one came in overtime. Photo courtesy of MSG Photos. Despite a sloppy game, the Rangers (30-16-5) managed to pick up a crucial point against the Dallas Stars (24-21-8) at Madison Square Garden, losing early in overtime by a final score of 3-2. It looked like the Stars were going to win in regulation, but Chris Kreider scored a clutch goal to send the Rangers to overtime. It was a relatively sloppy game, with the Rangers struggling to carry the puck through the neutral zone and to clear their own zone. They also seemed to have trouble keeping the puck in at the blue line, often losing possession that way. Basically, the fact that they were playing the second game of a back-to-back showed, for both teams. Despite the struggles, the Rangers managed to get 36 shots on net, and Kari Lehtonen made the stops to keep Dallas ahead. Many of the Rangers shots did not come from the “dirty areas,” but Lehtonen still had a very good game. Cam Talbot was in net for the second day in a row, and he had another steady start. The Second Stars goal was one he probably would like back, but other than that, he did enough to give the Rangers a chance to win, and that is all you can ask from your goaltender. The first period was very slow, with a combined total of 10 shots on goal. Talbot made a big save on an Antoine Roussel shorthanded chance, but not much else happened in the period. 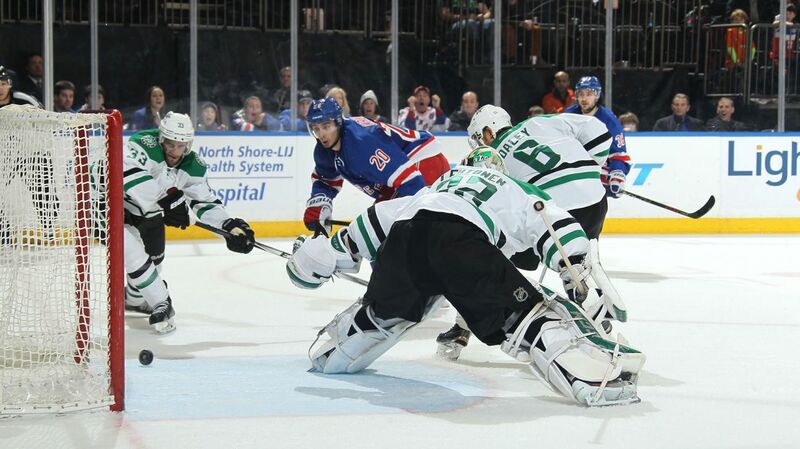 Early in the second period, the Rangers took two quick penalties, giving the Dallas Stars a 5-on-3 opportunity. Marc Staal took a high sticking penalty, an unlucky situation on a clearing attempt, and Dan Boyle was called for slashing and breaking an opponent’s stick. On the power play, Jason Spezza scored his 10th goal of the season on a beautiful set play. Tyler Seguin, who is tied for the league lead with 59 points, hit Spezza’s stick with a perfectly timed pass, and he deflected it past Talbot for the first goal of the game. The Rangers battled back for most of the period, starting to create more offensive chances, and nearly beating Lehtonen. 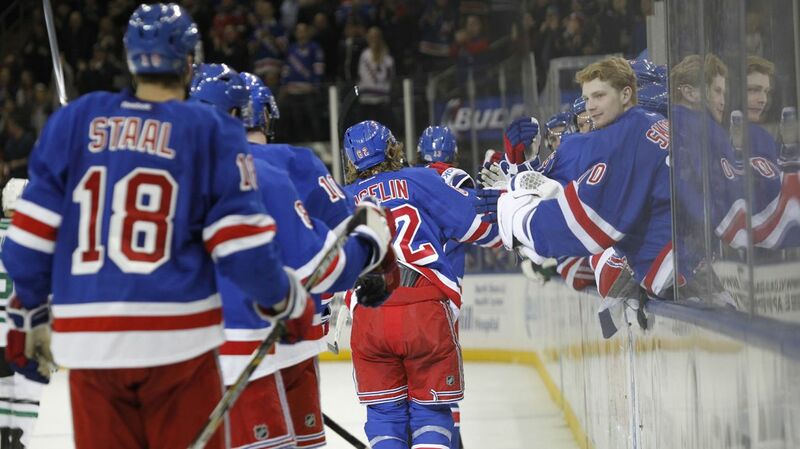 The Rangers managed to tie the game late in the period, with Carl Hagelin scoring his 11th goal of the season. The play started with JT Miller, who checked a Stars defenseman and forced him to lose the puck. Kevin Hayes gathered it, and made a great pass to Hagelin for an easy tip in, tying the game with 4:33 left to play in the second period. Carl Hagelin scored his 11th goal of the season to put the Rangers on the board, and picking up his sixth point in eight games. Photo courtesy of MSG Photos. But the Stars answered right back. Kevin Hayes turned the puck over in the neutral zone, and the Stars immediately went on the counterattack. Some nifty passing led to Erik Cole ripping a shot through the pads of Cam Talbot, who thought he saved the puck. The Stars suddenly had a 2-1 lead heading into the third period. The third period was all Rangers, as they managed to outshoot Dallas 20-2 in the final frame, a huge margin and testament to their play in the last period. However, they could not find the back of the net on most of their chances, which led to a tense late game situation. Late in the third period, John Klingberg took a penalty for delay of game, and the Rangers went on the power play with 3:16 left in the third period. On the ensuing power play, Chris Kreider stayed scorching hot, netting his 12th goal of the season. Right after Talbot was sent to the bench, Mats Zuccarello handled the puck, and fired it on net. The puck was kicked out with a left pad by Lehtonen, but Chris Kreider was there to hammer home the rebound, tying the game with 1:20 remaining in regulation, sending the Garden into a frenzy. The game was sent to overtime, and the Rangers picked up one point. Chris Kreider found the back of the net with just 1:20 remaining in regulation, giving the Rangers a much needed point. Photo courtesy of MSG Photos. The celebration was short lived, with Ales Hemsky scoring the game winning goal past a screened Cam Talbot, giving the Stars the overtime victory and the extra point, just 1:02 past regulation. In short, the Rangers were somewhat lucky to grab a point and overcome largely sloppy play through the first two periods. It wasn’t the greatest game, but picking up a point was crucial to avoid panic in Rangerstown. Chris Kreider had another fantastic game. Since ending his 18 game goal drought, Kreider has been one of the best and most consistent forwards on a nightly basis. In the last 17 games, Kreider has 13 points (7-6-13), also playing very physically and adding another dimension to the Rangers attack. 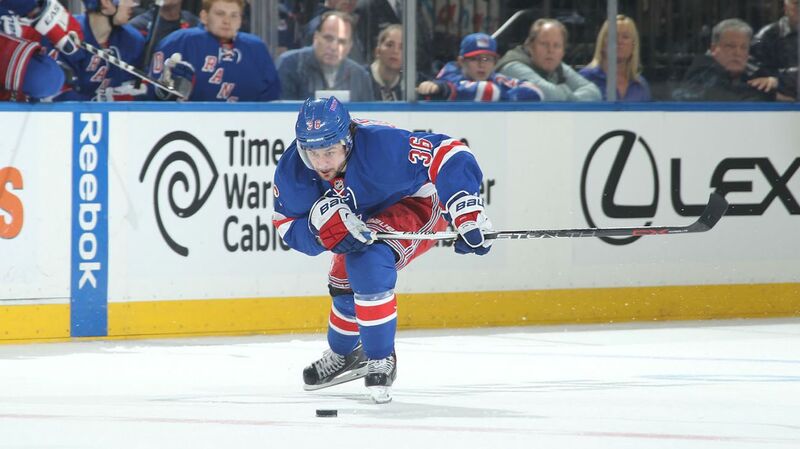 Although he has struggled to find the back of the net, Mats Zuccarello has been putting points up on the board. His assist on Krieder’s goal gave him an assist in five consecutive games, and a total of 29 points (8-21-29) this season. The point total isn’t where it should be, but he has certainly stepped up his game. The only thing left to do is start shooting more often. Mats Zuccarello picked up an assist on the second goal of the game, extending his assist streak to five games. Photo courtesy of MSG Photos. It’s always great to see Carl Hagelin score. The 26 year old Swede tallied his 11th goal of the season, and had a team high six shots on net. Hagelin also has six points (3-3-6) over the last eight games, and the Rangers could certainly use some consistent scoring from their bottom two lines. The Rangers will travel to Toronto on Tuesday for the start of a four game road trip, which will end with a matchup against the Islanders. Posted on February 9, 2015, in Game Recaps and tagged Alain Vigneault, Cam Talbot, Carl Hagelin, Chris Kreider, Dallas Stars, Dan Boyle, Dan Girardi, Derek Stepan, Derick Brassard, Dominic Moore, Filip Forsberg, Henrik Lundqvist, Jesper Fast, John Moore, JT Miller, Kevin Hayes, Kevin Klein, King Henrik, Lee Stempniak, Mackenzie Skapski, Madison Square Garden, Marc Staal, Martin St. Louis, Mats Zuccarello, Matt Hunwick, MSG, MSL, Nashville Predators, New York Rangers, New York Rangers trade rumors, NHL, NHL 2014-2015 Season, NHL All Star Game, NHL Trade deadline, NHL Trade Rumors, NY Rangers, NYR, Pekka Rinne, Rangers, Rangers Nation, Rangers trade rumors, Rangerstown, Rick Nash, Ryan McDonagh, Tanner Glass, The Ranger Zone, trade deadline, Tyler Seguin. Bookmark the permalink. Leave a comment.